Communal riot in Kasganj was pre-planned, which is evident by the events of that day. On the said day, on the occassion of 26th January, Muslims of Kasganj PS area had organised a meeting at Abdul Majeed Chowk. At the same time, approximately 100 youths belonging to Hindu Yuva Vahini, ABVP and RSS arrived there on Motor Cycles holding Tricolor and Saffron Flags, shouting slogans. They asked the organisers to hoist the saffron flag instead of the Tricolour. At this point, Muslims requested them to take the other route, but they insisted on using that way only and ruined the rangoli made there by the motor cycle. On this, quarrel started between both the groups, at that point the people from that ‘Tiranga March’ started shoutingw objectionable slogans like “If you want to live in India, You will have to say Vande Matram” and “Mullas deserve only one place: Pakistan or Graveyard”. As things escalated, stone pelting and firing from both the sides srarted in which a boy from one side died and two people from the other group also got shot. One person who has sustained the bullet injury has said that he recieved it when a Sub-Inspector of the Police fired at him. 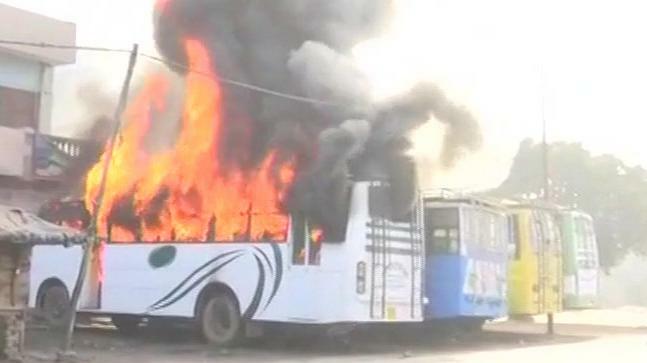 After this all, rioters from one side burned one bus, one tractor, and one stall. This is mentionable that the so called Tricolour March was being carried without any permission. After this incident, heavy police enforcements were posted in the town. The next day, after the last rites of the deceased youth, the BJP MP gave this incinting speech that “We cannot forego the death of our this youth on any condition.” After this speech of his, even after the presence of heavy Police force, the riot again started and a house and six shops belonging to muslims were burned. It has come to the notice that even after the presence of heavy police force, shops and vehicles belonging to the Muslims have been again burned. It is a matter of concern that how this arsoning could take place in even in presence of the Police Force. Role of the Police is also under doubt. It is clear from these events that the communal riot in Kasganj was a part of the riot politics of BJP.